To answer this question, we need to understand what pruning does to a plant physiologically. Plants are genetically programmed for apical dominance. That’s a botanical term that describes the simple phenomenon that plants always want to grow upward. Apical dominance is enforced by the terminal bud – the bud at the end of each stem - which produces a constant supply of hormones that keep the buds below it from growing. When that terminal bud is removed, production of those suppressive hormones ceases, and the lower buds are released. As a result, pruning stimulates a lot of new growth, as multiple buds take over the job that just one single bud was doing previously. Blooming again later in the season. 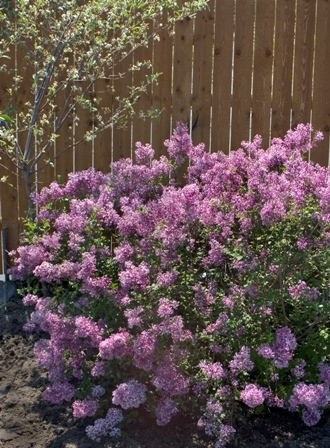 Reblooming plants like Bloomerang® lilac (photo, right) and Bloom-A-Thon® azaleas flower more their second time based on how much new growth they put on after their first bloom. A light trim after they’ve finished their spring bloom means a better show come summer! Better leaf color. Many plants with variegated or colorful foliage, like 'Summer Skies' butterfly bush or Glow Girl® - Birchleaf Spirea, display their best color and pattern on young growth. Pruning keeps their foliage vivid and showy. To neaten the plant’s appearance. Some plants, like ‘Limelight’ hydrangea keep last year’s flowers on their stems. These can be cut off in spring to keep the new growth and the current season’s flowers looking crisp and clean. To control the plant’s height and/or spread. Sometimes, a plant that is really too large for the space will have been planted and you will want to prune it to stay a manageable size. 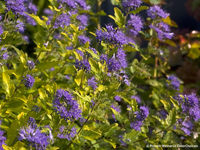 And some plants, like Sunshine Blue® II caryopteris (photo, left) and Black Lace™ elderberry, are capable of becoming rather large plants, but you may want to use them in a flower bed or a smaller landscape that requires some pruning to keep them tight and compact. I live in an apartment complex on the first floor. The hedges on the side and back of my apartment have grown to a height that is 1/4 up the window. The staff says the landscape company says if they trim the hedges below the window it will cause the hedges to die. Can someone confirm or deny this. I have had hedges trimmed in two of the houses I have owned and the trimming helped fill out the base. It's hard to say without seeing the plants. However, if a plant has not been maintained and has developed a lot of thick, woody stems, cutting it back can cause slow recover and unsightly "holes" to form in the planting. Ultimately, it depends on the species of plant, its care level (ie, regular watering, etc.) and how thick the stems are. Many University "edu" sites have such charts. Check their downloading policy---- many allow at least one copy to be printed for educational use. My bridal wreath is getting too large for the area, but I would hate to lose it. Can I prune it back a bit without losing too much of it's natural look and when is a good time to do this? Yes, you can prune your bridal wreath spirea. The best time to do so would be immediately after it finishes flowering this spring. Generally speaking, you should prune it by removing entire stems at the base or where they connect to a large stem - avoid simply cutting back the branches, which will interfere with its natural habit. When should I cut back my grasses, some day in spring and others say in fall, what is the best. Time? Some grasses are very pretty with their cat tail end so I leave my grasses for cutting back in the spring before I see new growth emerging. Warm season grasses should be cut back in Fall or by Mid to Late Spring. The article has more in depth information. I am hoping you or someone can please help, as I am a beginning gardener. My landlord and I planted some shrubs in the yard in mid May, about 1-1/2 months ago. He torched some weeds near the bloomerang lilac, yellow potentilla bush, and magic carpet spirea, and now they all have a bit of heat and fire damage on some branches and leaves. The poor babies!! I saw on one website that sometimes it is best to leave the bush alone and see how it does until fall, early winter and then prune when dormant. Is this correct? Or should I prune off any branches that have the heat and fire damage now? Will this further stress the little darlings? Please help! I chose them all with such great care and enthusiasm, I don't want to lose them. Thank you. Carrie. I'm sorry to hear that! I would definitely not prune anything now. Even though it may be a bit unsightly, it's really best to let the plant show you the extent of the damage. The foliage that was burned will probably drop, but that's not a cause for concern. Just keep your plants free of stress by keeping them well-watered, making sure the soil is well drained, and protecting them from further damage, whether by humans or rabbits. If no new growth emerges from the area next spring when the plant starts leafing out, then you can prune those portions off. I plated two hydrangea and all the flowers are mostly dead. Do I remove all dead flowers. If you'd like to, you may - it's up to you. If you do want to cut them off, cut just above the point where a set of two full leaves are emerging. We have five barberry in a row--three are larger and were planted first. Two are smaller and were planted later. Can I spring trim the older three to be a little smaller in size to even out the row? I live in Zone 4B (Wisconsin). Yes, you can definitely prune your barberry. I would wait until after the new growth has emerged and hardened off a bit before doing so - I'd guess in Wisconsin, late May would be the best time for it. What should I do about overgrown boxwoods? I am afraid that pruning will not bring them back to a manageable size. I would rather not have to take them out of my landscape. Should I try to prune them? I would not recommend severe pruning of boxwoods - they will take a very long time to recover. I would try to prune them a little bit at a time over several years rather than trying to do one extreme cut back. 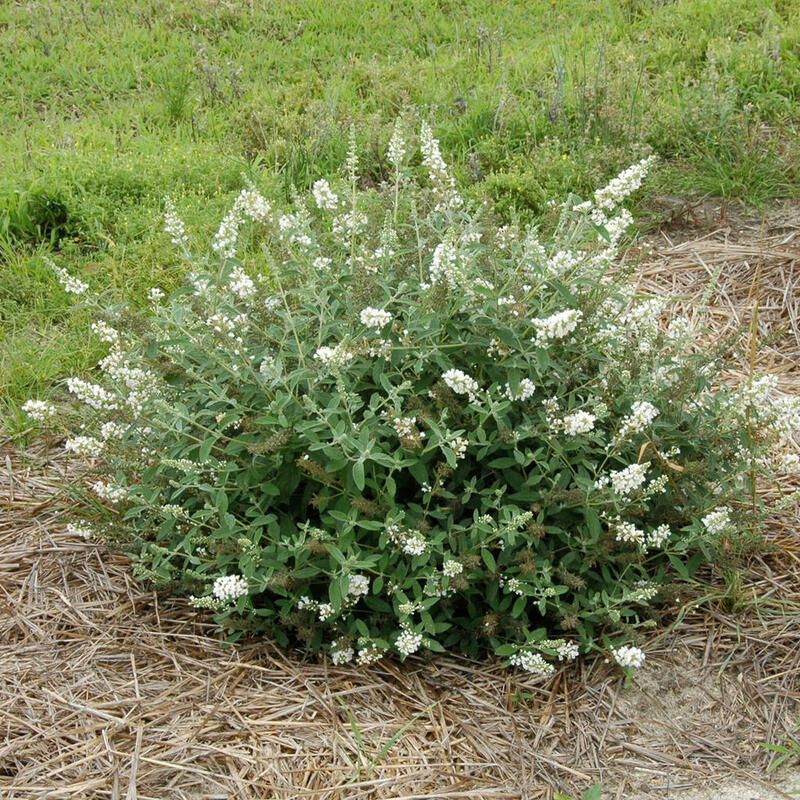 We'd be happy to offer more specific guidance - contact us here: https://www.provenwinners.com/feedback (select "shrubs" as the category) and I'll tell you where you can send a photo, which would help us address your situation more directly. I have several that I have inherited on the property of my parents. I do prune them after they bloom. I was told to prune the new growth to shape them. However, several are kind of dead on the backs of the bushes and several seem to have lot of dead wood in the middle. they are about 8 years old. We have very poor ground in the mobile park. How can I get them to be full and not have so many dead branches? I have given them azaleas fertilizer also after they bloom. Please advise what exactly do you do with them. Go ahead and prune out all of the wood that you know is dead - this will help you see what you are left with, as well as help bring light and air into the center of the plant, which should encourage new growth to form. To get a lot of new growth on the top of the plant, you'll need to create an environment that fosters healthy root growth, as the top can only grow as much as the root system can sustain. To encourage better root growth, I would recommend applying a 2-3" thick layer of mulch (shredded bark, compost, or pine needles are all good choices) and watering the plants regularly. 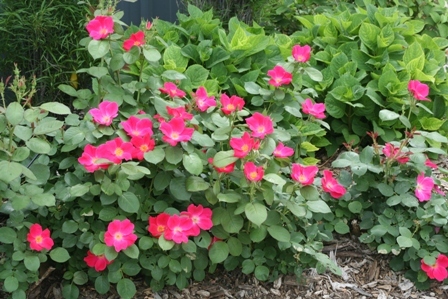 Fertilize them in early spring each year. This should get them back on track to lush growth and vigorous flowering. Thank you so much Stacy for a very informative lesson. I've known the "WHAT" of what happened when you cut off the end of a branch or stem, multiple stem growth and/or blooms, however no one ever explained the "WHY".!! Very informative article and I'm looking forward to more!! Again, thank you and PW for as ever, excellent information!! t.w. Pruning chart? You bet, I would love one also. Chart showing crepe myrtle, sonic boom weigela, Little Henry, Happy Face , butterfly bushes (dwarf), Rose of Sharon, and so on. Always, always, have questions about correct pruning. A chart of some sort would be fabulous! Would love a pruning chart. I would like that too!!!! Totally agree about the chart. This would be very helpful. This was so informative. Thank you for taking the fear out of pruning. Look forward to the next article. Allot of good information. I can not wait for the rest of the series. I am hoping there will be info on pruning apple trees. Yes prunning apple tress info would be nice. Also Bing cherry and plums.